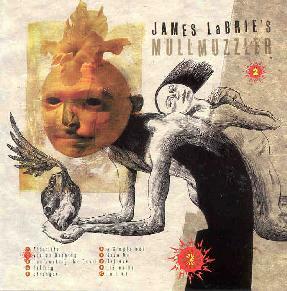 James LaBrie's Mullmuzzler - "2"
James LaBrie is the voice behind the popular progessive metal band Dream Theater. He joins once again with musicians who have played with Frank Zappa, Steve Vai, and Extreme to produce Mullmuzzler's second album - an attempt at mixing prog, metal, and even some psychedelic rock. Dream Theater make heavy use of keyboards, so I was interested to see how this project would up the ante and take us into unmapped dimensions of space. Unfortunately, the music offered here hardly deviates from Dream Theater's general style. Technically, the writing and execution are solid, but do not achieve the consistency or flow that I would have expected from a true progressive work. There are some standout-out moments such as "Venice Burning" and "Confronting the Devil," but they are basically metal/rock tracks with some progressive passages. Each one has its own drastically different mood that does not match the rest of the album. The second song seems like it was taken off Bruce Dickinson's (Iron Maiden) solo album entitled The Chemical Wedding. This may be beneficial for Dickinson fans, but it leaves LaBrie fans in a lurch. The remaining tracks are more pop rock than progressive. On the track "Falling," for example, LaBrie's vocal style is very soft and sing-song. The campfire-style acoustic guitar and cheery piano simulations make me wonder why this song was even included. It features a sound sample of what I believe is Princess Diana lamenting over the suffering she has witnessed over the years. The next track, "Stranger," boasts some musical tension that revisits Dream Theater's more grandiose synth moments, but LaBrie's voice is still pop-oriented in an almost ballad-like mode. This occurs on most of the remaining songs. I find this extremely incongruous with the decent musical effort on many of the tracks. He does not recapture the edge that propelled the aforementioned good songs above the rest. "Save Me" is another decent track, but it shoots off into slow, brooding guitar solos that don't fit very well either. I find LaBrie's voice on this one flat and almost forced. The music is often well-written and executed with energy, but lingers in the realm of watered-down Dream Theater when it doesn't fully submit to the pop inclinations of the vocals. The vocals and music rarely find synchronicity in style, and virtually never dwell into the thick, space atmospheres they could have profited from. The keyboards appear from time to time as a solo instrument rather than an atmospheric base. The vocals are mostly love-songish. While the music is well written, the lack of cohesion and cooperation with the vocals and the absence of a central style make the album a somewhat unsettling experience. Even though I have been quite critical of it, I suspect a great many people will enjoy this CD. Fans of Dream Theater, power metal, and pop-oriented progressive rock will certainly get something out of this. Outside of those styles, I would not recommend it, especially for anyone who is hoping for thick progressive or psychedelic rock, or keyboard-heavy space rock. Magna Carta; PMB 1820; 208 East 51st St; New York, NY 10022-6500.